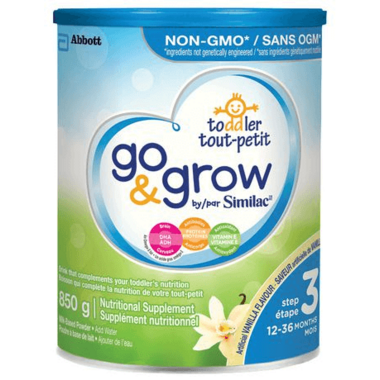 Go & Grow by Similac® Toddler Drink is designed to help support growth and development and to complement your toddler’s daily nutrition. An every day drink that is an excellent source of protein, and provides key nutrients such as iron, calcium, DHA and vitamin E.
Ingredients: Skim milk, sucrose, high oleic sunfl oweroil, lactose, soy oil, coconut oil, galactooligosaccharides, artificial vanilla fl avour, soy lecithin, C. cohnii oil*, cholinechloride, choline bitartrate, M. alpina oil**, ascorbylpalmitate, mixed tocopherols, cytidine 5'-monophosphate, disodium uridine 5'-monophosphate, adenosine 5'-monophosphate,disodium guanosine 5'-monophosphate, minerals (magnesium chloride, potassium citrate, calcium carbonate, potassium hydroxide, sodium chloride, ferroussulphate, zinc sulphate, manganese sulphate, copper sulphate), VITAMINS (ascorbic acid, niacinamide, calcium d-pantothenate, vitamin A palmitate, thiamine hydrochloride,pyridoxine hydrochloride, ribofl avin, folic acid, biotin, b-carotene, vitamin D3). May contain: calcium chloride, calcium phosphate tribasic.